"Stop the Global Corporate Coup! All of our efforts to label GMOs could go up in smoke if the Trans Pacific Partnership is passed. This secret, corporate power grab threatens our health, our safety and our very democracy. Nation of Change lays out what we can expect if this corporate coup d'etat is allowed to happen. no labeling of GMOs in food." That's right. 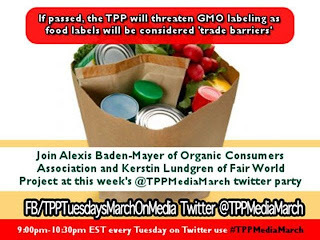 Under TPP, food labels, like labeling GMOs, and even country of origin labels would be considered barriers to trade and banned. 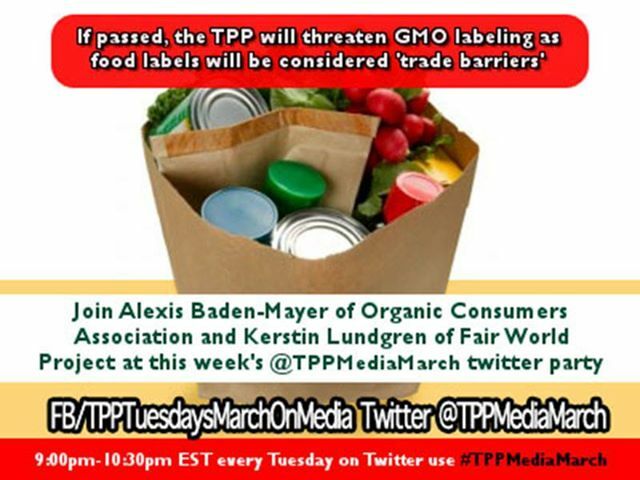 No surprise the person heading agricultural negotiations for TPP is a former Monsanto lobbyist. 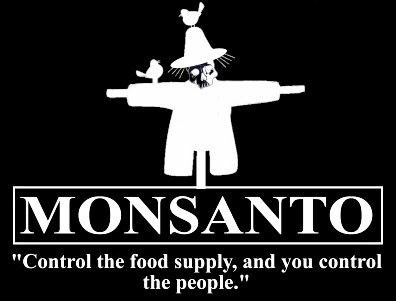 As consumers begin waking up, demanding to know what they are eating and feeding their families, Monsanto and the biotech industry have found a backdoor way to impose their products on a powerless public. Under the TPP, a corporation can sue a nation, state or local government for any laws that they say would reduce their future profits. Fracking bans, GMO labeling, laws for consumer protection and food safety and more could all be null and void if TPP becomes the law of our land. TPP sets up foreign tribunals to challenge laws the multinationals don't like. Corporate attorneys would be the "judges" and their decisions final. If that isn't corporate tyranny, what is? Legislation to protect the environment and public health would open countries to ruinous lawsuits. Such suits are already happening under NAFTA and WTO. They have sky rocketed since 2011 and the US has lost 95% of them. This is already having a chilling effect on legislation designed to protect the environment and public health and safety. 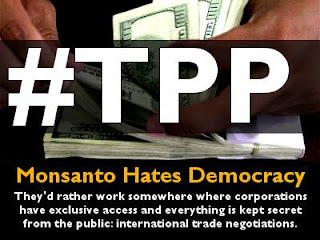 Billions in tax payer dollars could be transferred to corporations under TPP. TPP is The Global Monsanto Protection Act! We have to stop it. Please join the thousands of citizens rising up on Tuesday, September 17 to expose the dangers of TPP and to demand that it not be Fast Tracked through Congress! Fast Track, which is being pushed by the Obama administration would usurp the responsibility of Congress to review and amend trade treaties. Obama would sign it and Congress would only be allowed an up or down vote, with little debate, no public hearings and no ability to make amendments. We need our Congressman to vote No Fast Track for TPP! Please join us Tuesday in front of the Congressman's office. I spoke to his office in Washington today. I learned that Rep Gibson is usually for free trade treaties. Unfortunately, "free trade" has come to mean a free for all for multinationals at the expense of the rest of us. We are for Fair Trade that ensures that all have access to decent work, with living wages and that we have a liveable world to pass on to future generations. I mentioned that TPP is a direct threat to the sovereignty of our nation as corporations could override domestic laws. This could be a problem for the Congressman according to the staff person I spoke to -so there is hope that he may be persuaded to say no to Fast Track. Let's expose the TPP to the light and demand our representatives put the brakes on this Terrible Plutocratic Plan! Sign up here- https://www.facebook.com/events/421537034631062/ On Facebook, the event page is under "Stop the Corporate Global Coup, Stop the TPP, a Danger to Your Health and Safety"
On a related matter, this past week, the House of Representatives ignored the will of the people and quietly extended the odious Monsanto Protection Act. At the last minute it was slipped into the Agriculture Appropriations Bill for 2013. 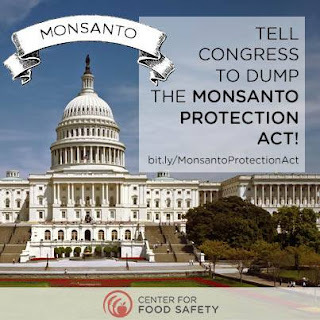 As you know, the Monsanto Protection Act also undermines our judicial system, by saying courts cannot stop the planting of potentially hazardous GM crops- even if they were approved illegally. Sen Jeff Merkley, D-OR has vowed to fight this "reenactment" that "nullifies court orders that are protecting farmers, the environment and public health". Many organizations are also taking this on. Sign the petition at the Center for Food Safety and call your representatives through Food Democracy Now! Fred Upton R-MI, (God, I hope we are not related) is introducing a bill that would make it illegal for states to pass laws to label GMOs. The biotech industry knows public opinion has turned against them- so they are reverting to secret, global deals, sneaky legislative maneuvering and pumping big money into misinformation campaigns. We can stop them. It begins Tuesday in Kingston. Please be there.